In this tutorial, learn how to use the Android WebView to display a web page that is embedded into your app, without connecting to the internet. Learn how to properly include graphics as well. 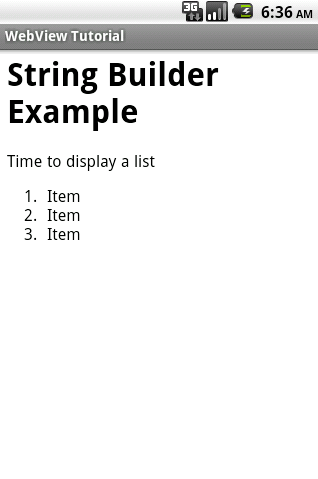 In a previous tutorial, we showed you how to display a web page from within an Android Activity. This is very useful, but there may be some cases in which you want to take advantage of the html rendering capabilities without having to download a file from the internet. 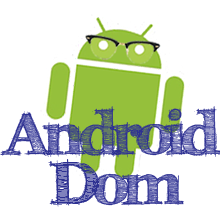 In this tutorial, we are going to build off the code from the previous tutorial, how to display a web page from an Android Activity. Please follow that tutorial to get started. 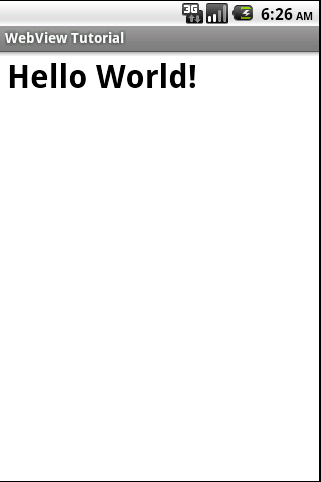 Run the program again, and you should be greeted with the message "Hello World." Try editing the manifest to remove the internet permission to verify that you don't need to connect to the internet anymore, even though you are using the webview. 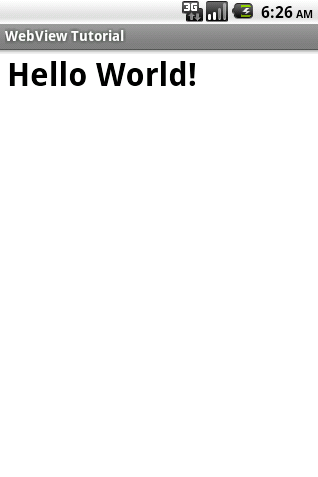 As you can see, the first parameter contains the html to display. Chances are you will want to display something a lot more complex, but you still want to keep your code clean and formatted well. 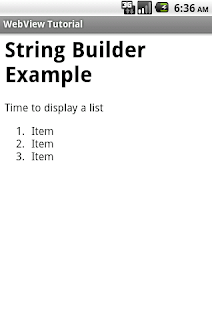 A good approach to handle this would be to use a StringBuilder. The code below demonstrates this. 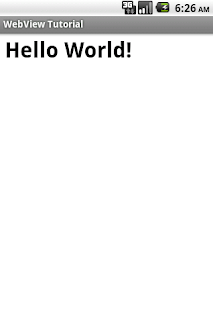 Below is a screenshot of what the code displays as. It is also possible to just save a static html page as an asset, and load this saved page instead of dynamically generating a page to display. 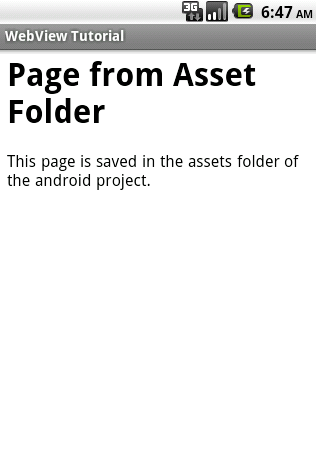 Create a simple html page, testpage.html in the assets folder for your android project. Place the following code in the file. 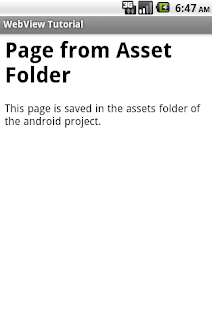 This page is saved in the assets folder of the android project. Run the program and you should get output similar to the following. If you want to add saved images to display, simply place them in the assets folder as well. 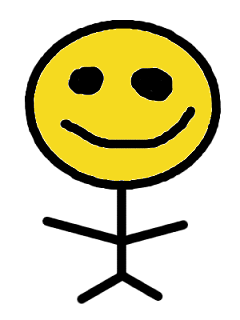 For this example we will add a picture of this "Smiley Man" to the web page. Update the testpage.html code to the following. 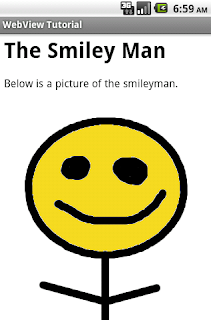 Below is a picture of the smileyman. Run the program and you should see something like this. 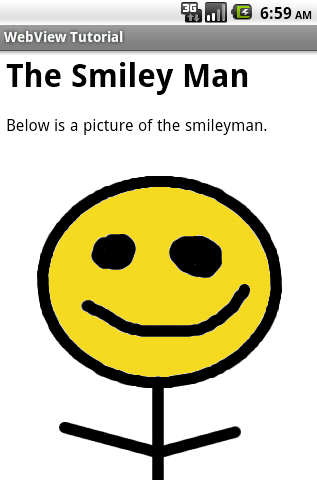 Screenshot of the webview displaying the smiley man. WebViews can be a great way to show formatted content in an activity, and you don't need an internet connection to use them. Content can be generated dynamically, or stored in the Assets folder of your project. Is it possible to load the graphics of a webpage locally but have the content of the page updated dynamically? IE a web forum through webview, where all the img files are loaded locally but the post in the forum itself are still loaded via the internet? Great idea. I wrote up a small tutorial that explains how to do this. Can we save a page in asset folder and load dynamically? Any idea to load the content page wise in webview?